We are an illustrious manufacturer & supplier of Industrial Power Electronic Equipment. These products are manufactured using superior quality raw material and technically advanced machines. The products we offer are demanded across the country for their features like easy operations, excellent performance, low maintenance and durability. We offer these products at market-leading prices in the market. Our range consists of AC Position Servo System Demonstration Units and AC Synchro Transmitter & Receiver Demonstration Units. Valued as a reliable manufacturer and supplier, we have been able to offer the optimum quality of AC Synchro Transmitter & Receiver Demonstration Unit. 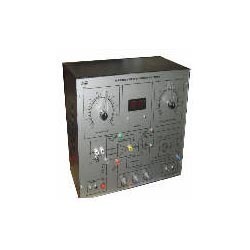 Designed as per the industry laid norms, the offered demonstration unit used as both demonstrator or experimental kits for studying the working of synchro transmitter. Besides this, the offered demonstration unit is used in schools and colleges. * Demonstrates the principle and working of Polyphase Rectifier. * Supply required three phase AC. * Built – in three phase step down transformer. * Half and full wave rectifier circuits using diodes. 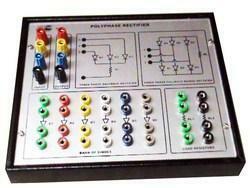 * Test points provided at various stages in the circuit to observe the waveforms and voltages. * Set of patch cords. * Housed in an elegant cabinet with a well spread intelligently designed circuit layout engraved on the front panel. 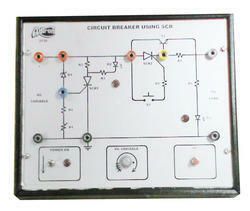 * Demonstrates the principle and working of circuit breaker using SCR. * Built – in unregulated variable DC supply. * Circuit breaker provides over voltage and over current protection. * LED indication for over Voltage and over current. * Push switch to reset the over current protection. * Demonstrates the principle and working of a temperature controller using SCR. * Supply required 230V, 50 Hz AC. * Built – in IC based DC regulated power supply with short circuit protection and LED indication for supply “ON”. * RTD probe as sensing element. * Built – in digital readout for measured temperature. * Built – in complete heating process & mercury thermometer for comparison. 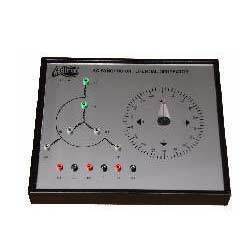 * Built – in solid state electronic controller with variable set points. 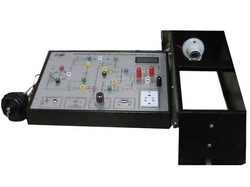 We have been able to manufacture and supply the premium quality of AC Position Servo System Demonstration Unit. Due to its high performance, low maintenance and durability, the offered AC position servo system demonstration unit is highly demanded. Total quality management ensures that the quality of the offered unit is maintained at our end. To meet the precise needs of our patrons, we offer AC Synchro Differentiator Generator Demonstrator. 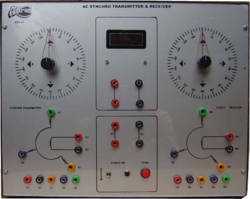 The offered demonstrator is used to study the working and construction of an AC synchro differential generator. 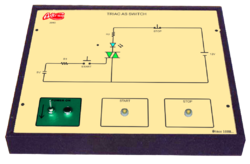 In addition to this, we offer this AC synchro differentiator generator demonstrator in various specifications and sizes. The demonstrator is housed in a specially designed user’s friendly elegant cabinet with intelligently designed layout on front panel. It is strongly supported by a comprehensive instruction manual complete with theory and operating details. 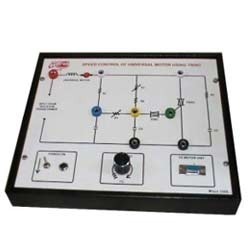 Principle: ac position control system. Displacement: angular displacement; clockwise & anti-clockwise. Working: as part of the remote control system used in between the ac synchro transmitter and receiver for getting a difference (i.e. addition or subtraction) between the two. Mode: addition or subtraction; selectable by connection. Differential: specially designed six terminal induction type low friction component consisting of wound rotor and wound stator. Controls: differential generator knob mounted on its shaft. Test points: multi-coloured test points are provided at various stages in the circuit to observe waveforms and voltages. Power requirements: it will derive its required power from ac synchro transmitter & receiver. Standard accessories: 1. Set of required number of patch cords. 2. Detailed instruction manual. Note: the ac synchro differential generator requires adtron’s ac synchro transmitter & receiver demonstrator for performing the experiment. Being a leader of this domain, we manufacture RIAC Motor Control Demonstration. 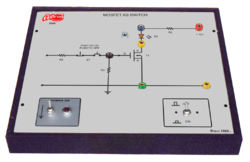 Used in schools and colleges, the offered RIAC motor control demonstration unit is known for its longer serving life. Our engineers manufacture the offered demonstration unit as per the industry laid norms. Looking for Industrial Power Electronic Equipment ?